I was talking to my brother on the phone (who is a great chef at a well known restaurant) and saying how I wanted a recipe for a nice chicken and vegetable soup. I said "I want it to have celery, carrots, potatoes, and corn…" and he said "You don't need a recipe, just make a soup with that!" 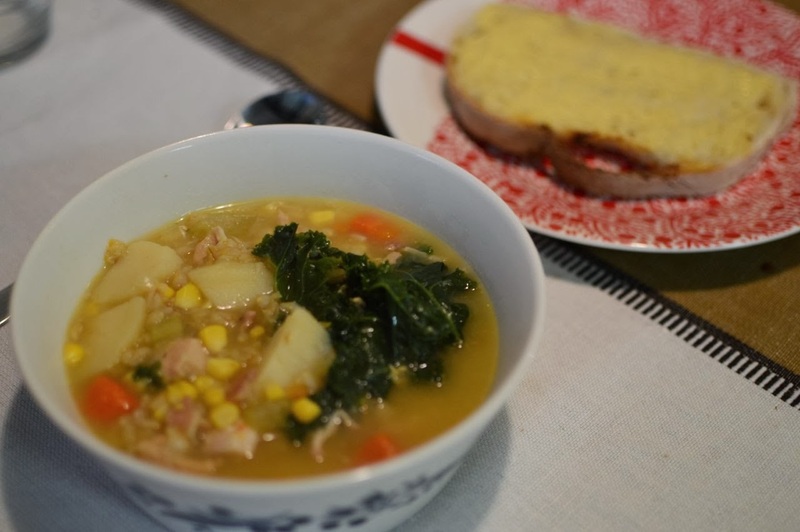 Tonight we dined on the most filling, hearty, tasty, and healthy home made soup. It makes enough for 8 serves, so we have 3 boxes of soup in the freezer for next time! herbs - whatever tickles your fancy. I used tarragon and rosemary I think. Firstly fry your bacon a bit. It doesn't need to be super crunchy, just cooked a little. Now add in all the things except the kale, mix, and cook it up! We used a pressure cooker set to high pressure for 30 minutes, and then put the kale in last. If you don't have a pressure cooker, just put it in a large pot and simmer for a couple of hours. I recommend getting a pressure cooker though! When it's done you might need to add some water to thin it out, I added about 2 cups and brought it back to a boil. Eat with a bit of buttered toast for pure luxury!